I began installing the backdrop relief panel at Glenrock in January. This is spaced in front of the sky the thickness of a 1X2 (3/4"). Behind it will lay the red sunrise / sunset lights - red Christmas Tree rope lights. A close-up of the relief panel. 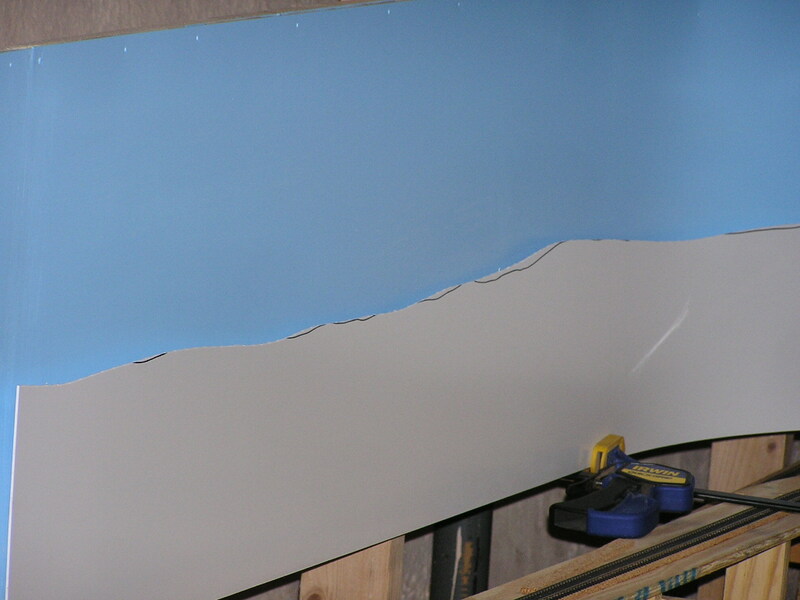 The tops of distant hills are cut into the panel. 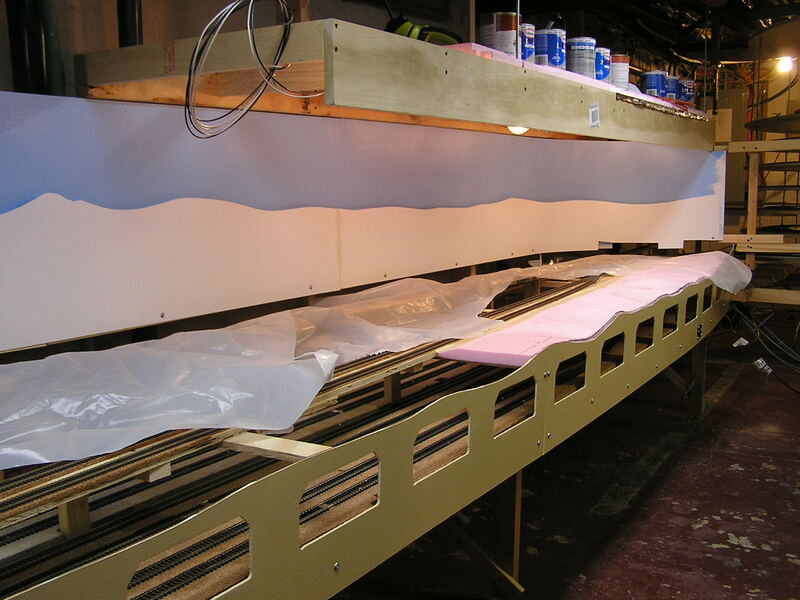 This will be painted the appropriate colors, and 3-D scenery will begin somewhat below the top. 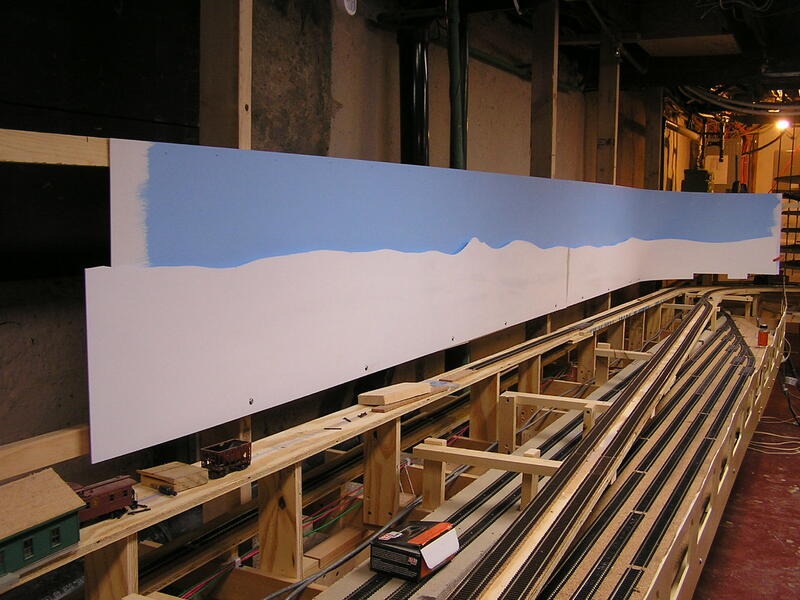 By February 1st, the relief board was in place for the entire length of the sky. This is looking along tracks in Minneapolis staging yard. I got curious as to what it looked like under there. In mid February I started playing with the Laurel roundhouse area. 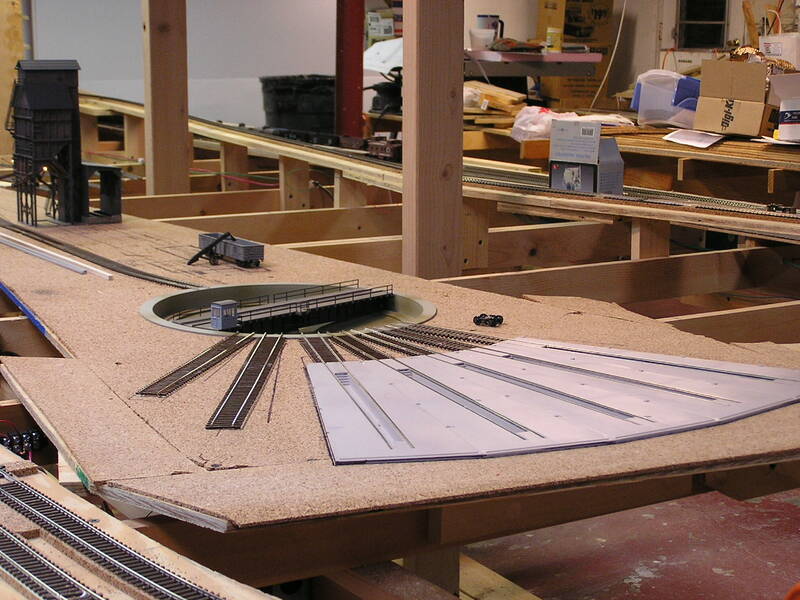 Here I installed one of the outdoor turntable radial tracks. My focus was mostly on Glenrock in February, though. 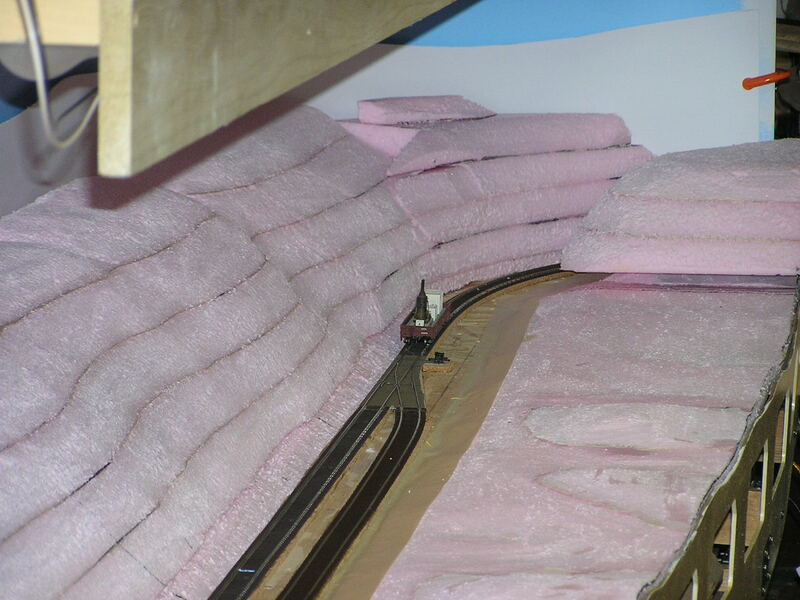 I installed a bunch of horizontal 1X2s to support the styrofoam scenery. 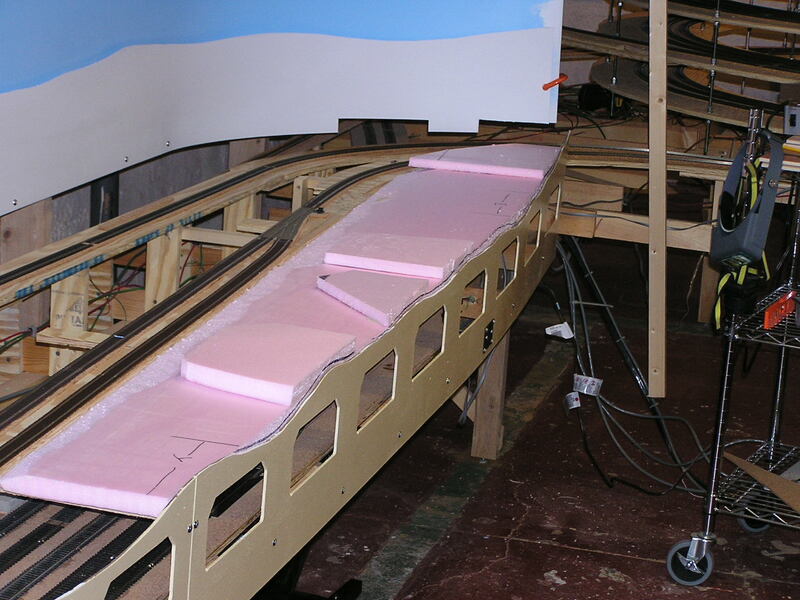 And here's the base sheet of styrofoam carved to rough shape and laid in place on the scenery supports. 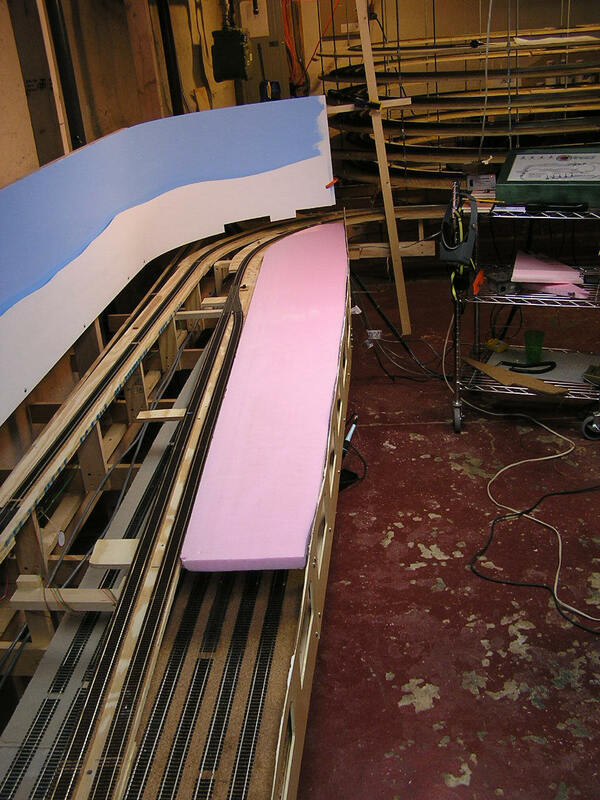 I started out by adding several odd-shaped blocks of foam on top of the scenery base. I rounded off the scenery shapes using a serrated knife and a surform tool. I tried a foam carving hot knife, but it was too slow. The surform tool requires more elbow grease, but I like its control better. During the latter part of March I turned back to the roundhouse area in Laurel. 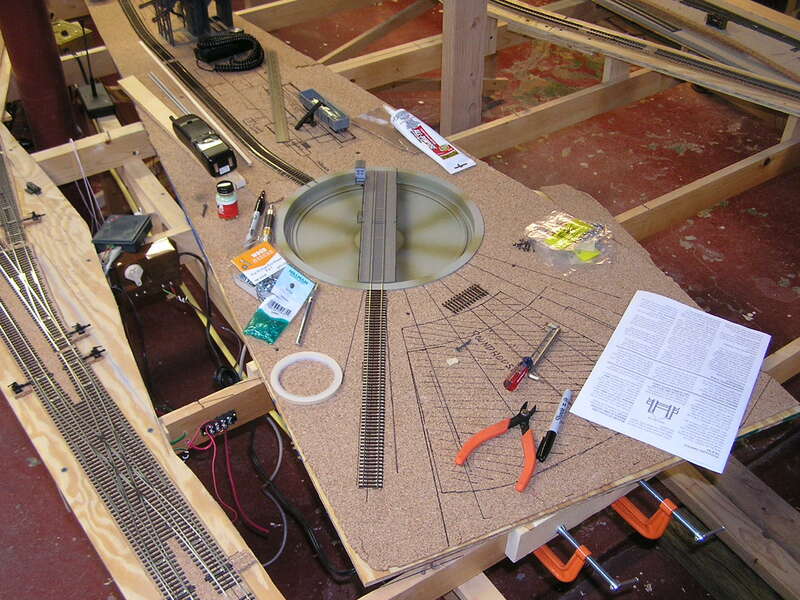 I cut a large hole in the subroadbed for the inspection pits, and installed the floor per the turntable instructions. 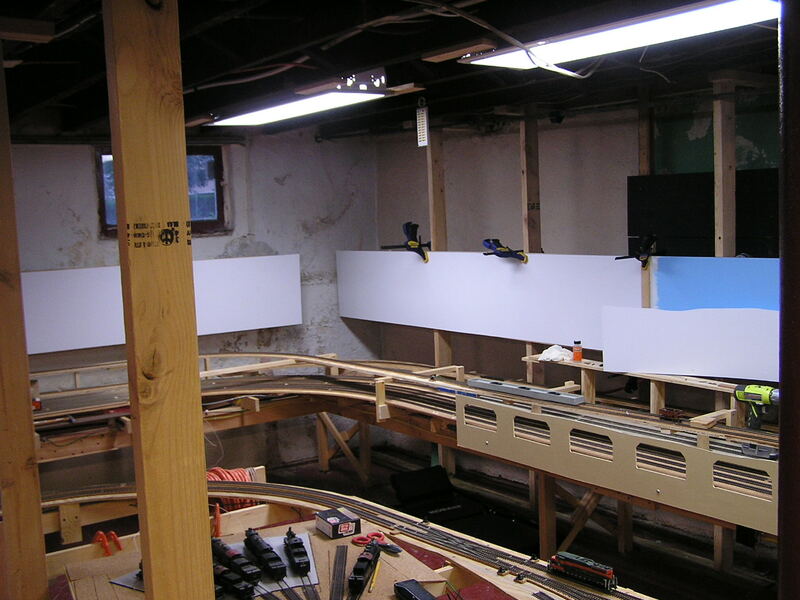 I had to fiddle with the tracks to get the alignment correct, but after only ten or fifteen hours of work, all tracks were installed and wired - fully functioning. 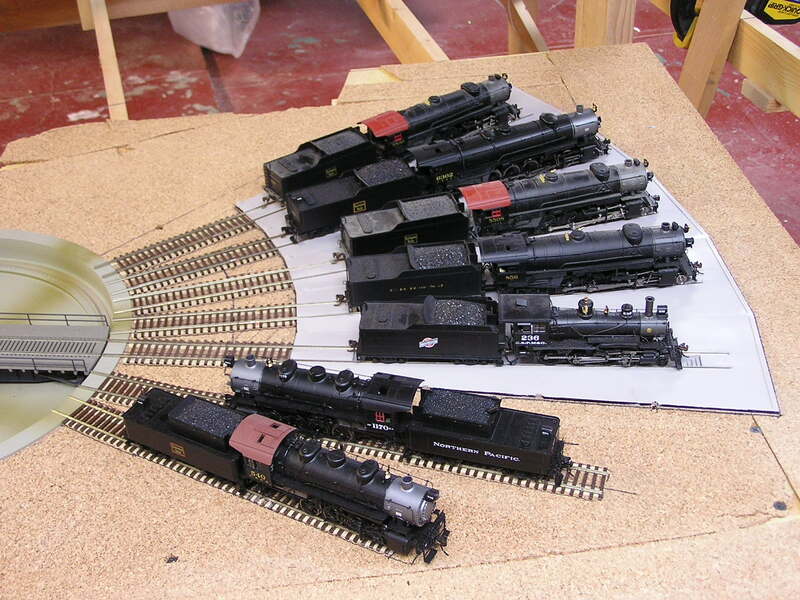 I may install a rotary switch on the control panel in the future so that only one track is powered at any one time - no need to run all those decoders all the time! Another view of the roundhouse floor. 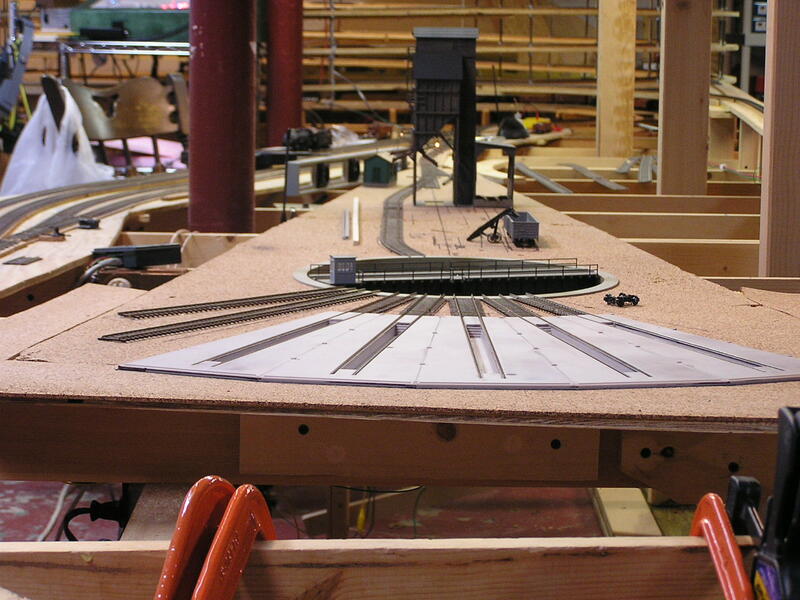 Weathering will be added when the roundhouse is built above the floor. Finally - a place to park locomotives! 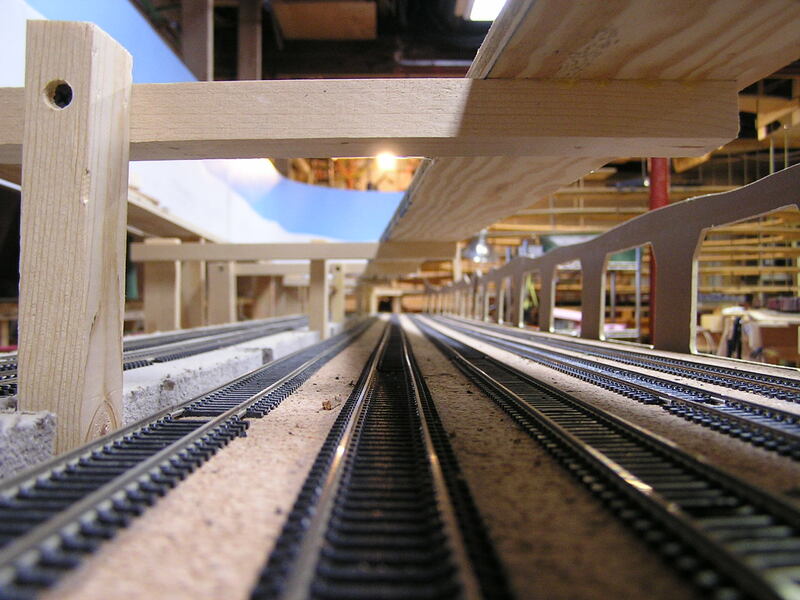 They had been setting out in Laurel's interchange yard or in the staging tracks. 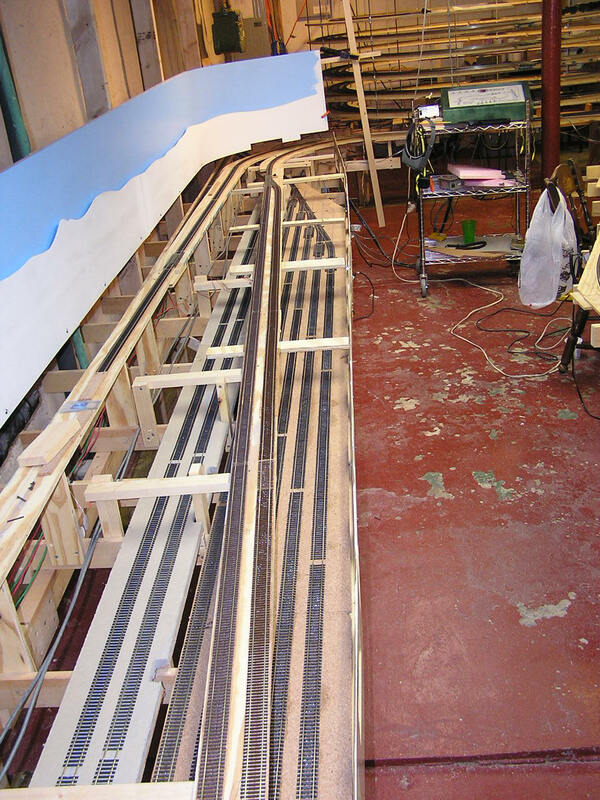 Another view of the tracks, full up. I discovered, as I half expected, that the foam scenery base above the IRDots reflected too much of the beam back down to the sensor, giving false occupied indications. 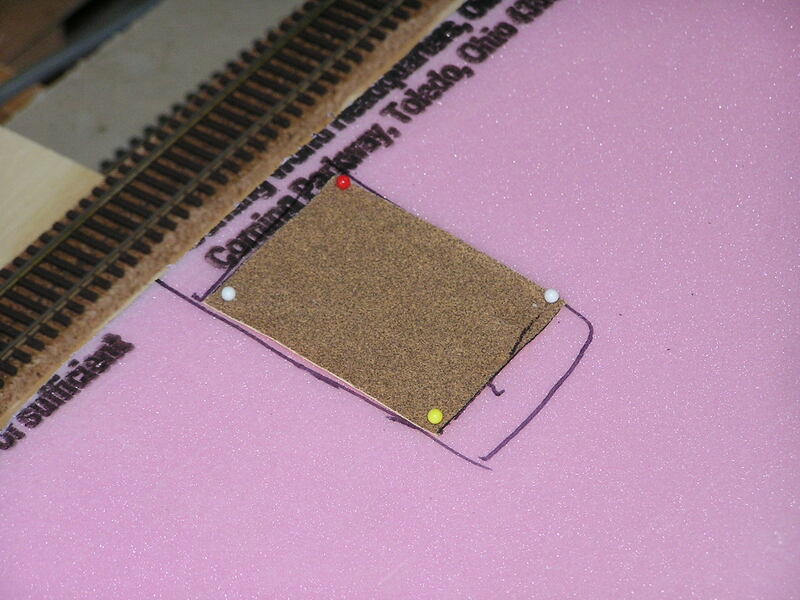 To eliminate the problem, I attached squares of sandpaper to the bottom of the foam over the detectors. 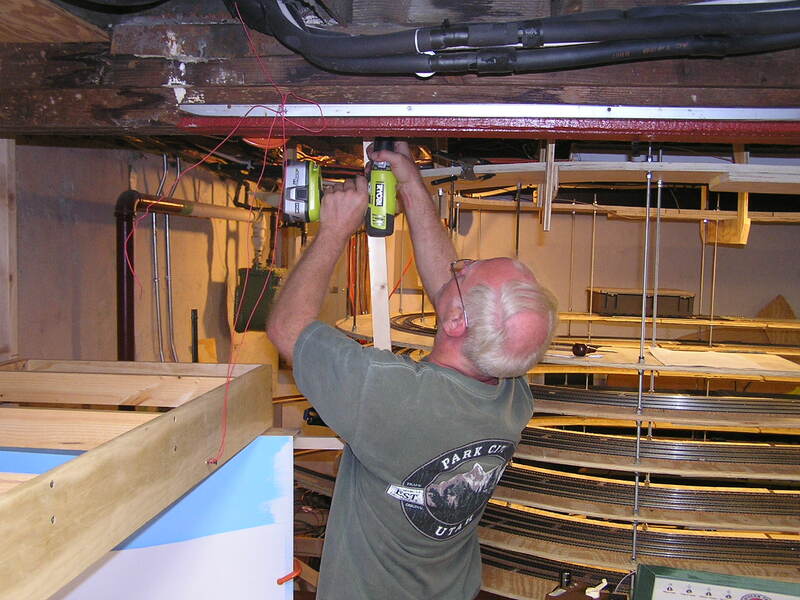 The sandpaper scatters the beam - no more false indications! The pins were just in place until the glue dried. Sandpaper glued so it will sit over all five detectors at the west end of Minneapolis staging. 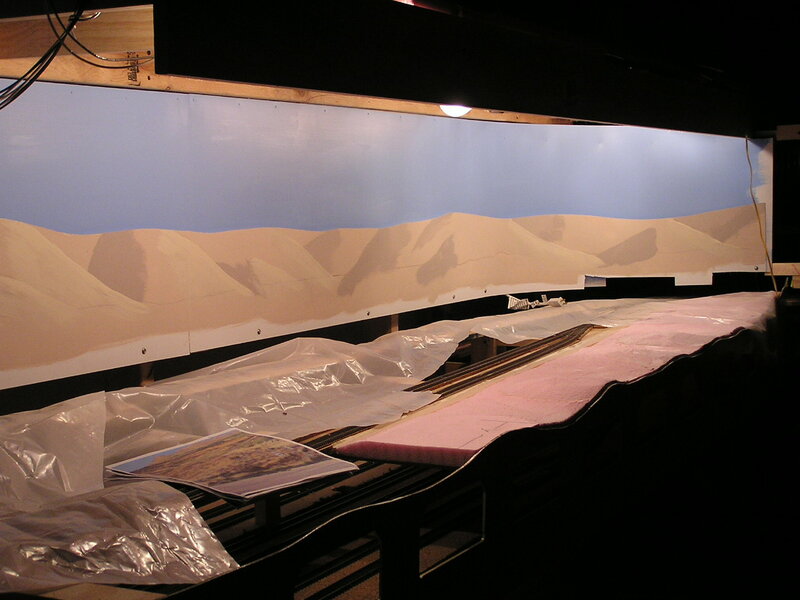 An event that I've anticipated for years - scenery construction beginning in earnest! The base in the above photos will be used, but it was a test to see if the styrofoam would work, and what sort of pitfalls I might have with it. This is the first real stack to make some hills, which will go behind the track at Glenrock. 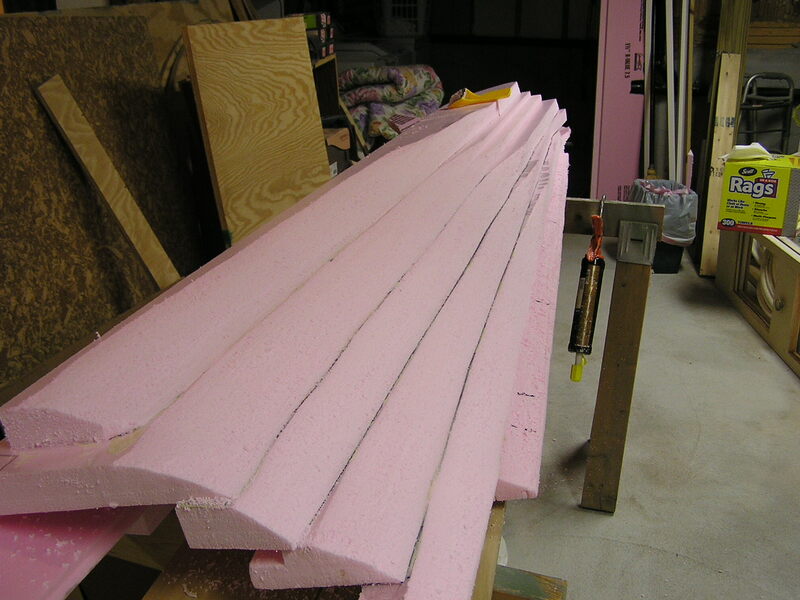 I glued the foam sheets together using Liquid Nails for Projects. And now I've started the carving process. 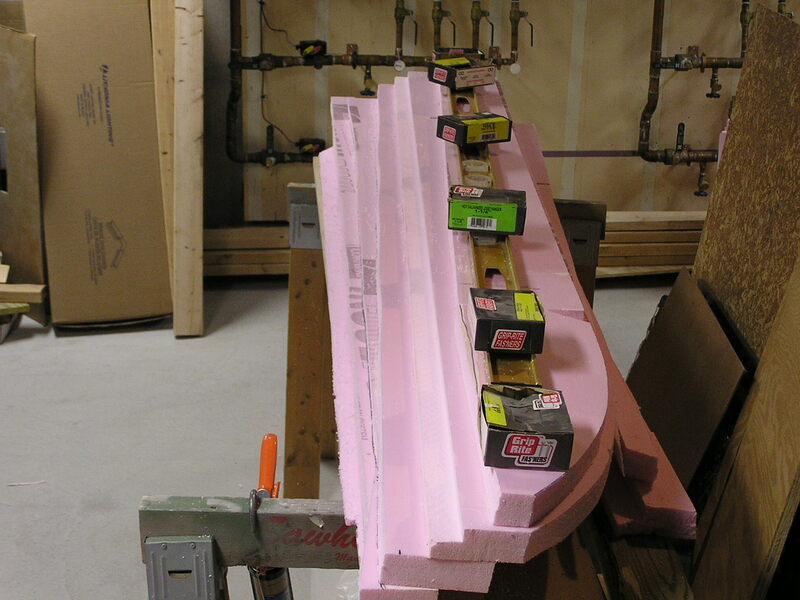 I still like the surform tool, but it make a lot of tiny little pink shavings! After I rough carved the first pieces of foam, I realized that I had to put in the upper deck in the area to test out lower level lighting. 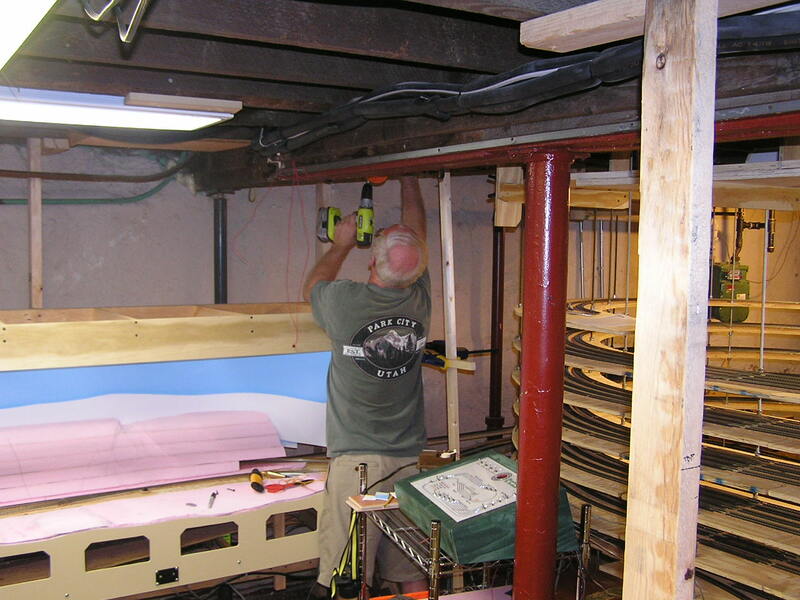 So on April 19th my good friend Walt, who helps with the heavier work on the layout, came over and helped install the first section of upper deck benchwork. Holy cow - another milestone! The threaded rod worked so well on the helix that I decided to use it to support the front edge of the upper deck benchwork. The back is attached to the studs you can see in various photos. The backdrop mount - a 1X2, worked great as a rest for the upper deck until it could be secured to the studs (I actually did plan it out that way). The end of the day - the first upper deck section of benchwork is in place! 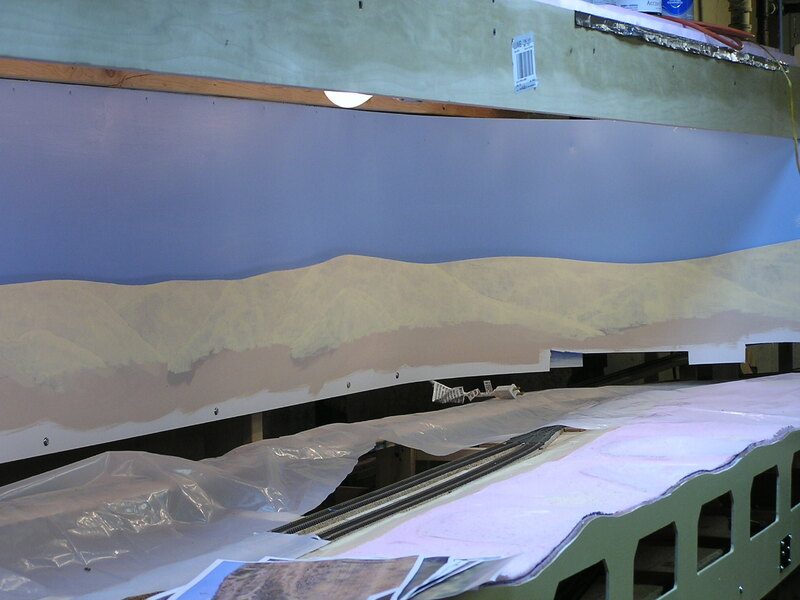 The benchwork installation went so easily that we had time left over to mount a couple more sections of to-be-sky backdrop, which will allow the completion of sky behind Glenrock and around the wall behind part of Thermopolis. 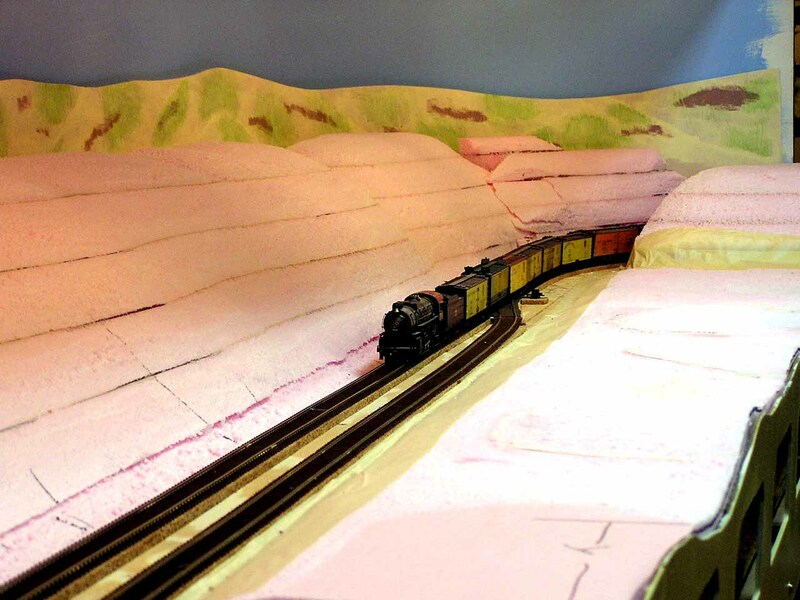 Here's a shot of the test train running out of hidden trackage between the pink hills of the Glenrock area. 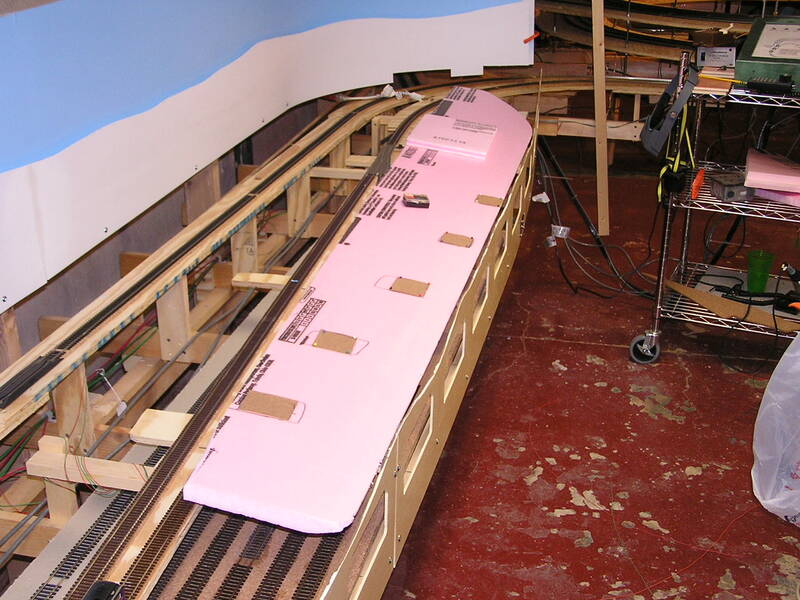 I discovered that the hole in the backdrop was too low, and a somewhat over-height gondola load hung up. A bit of trimming and it's fine now. 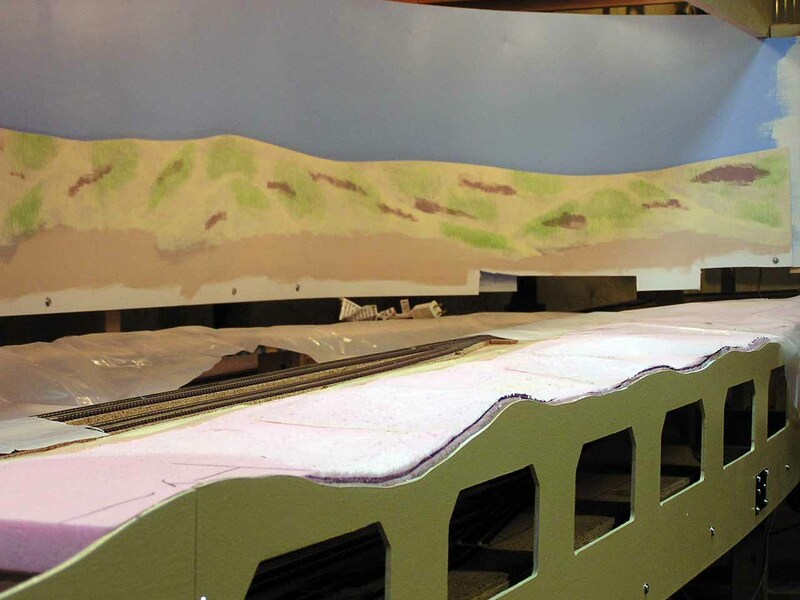 By late June I extended the backdrop around the end of the Glenrock benchwork and into the Thermopolis area. 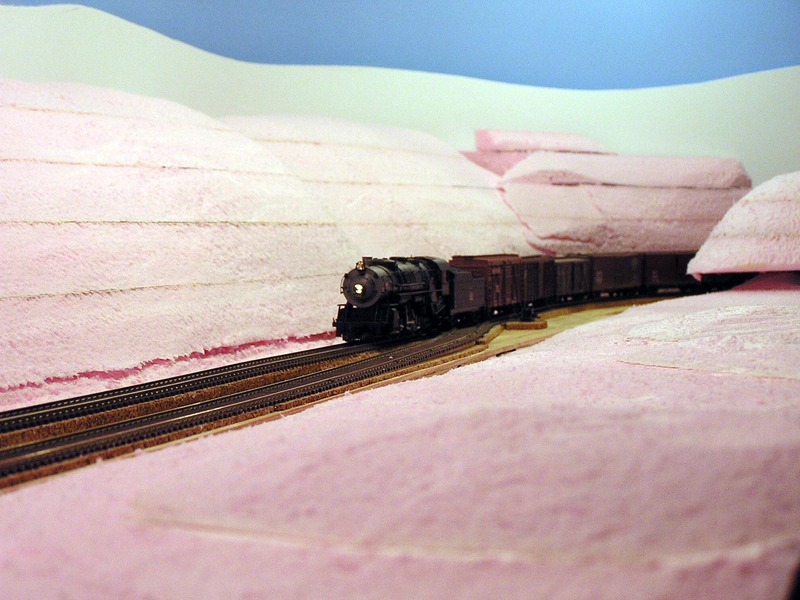 Here's another view of the helix end of Glenrock, showing how the foam ground shapes are positioned and how the track curves behind a hill for the pass through in the backdrop. In July I began painting some of the background hills behind Glenrock. Laying across the tracks are photos I took of the area I'm trying to reproduce. 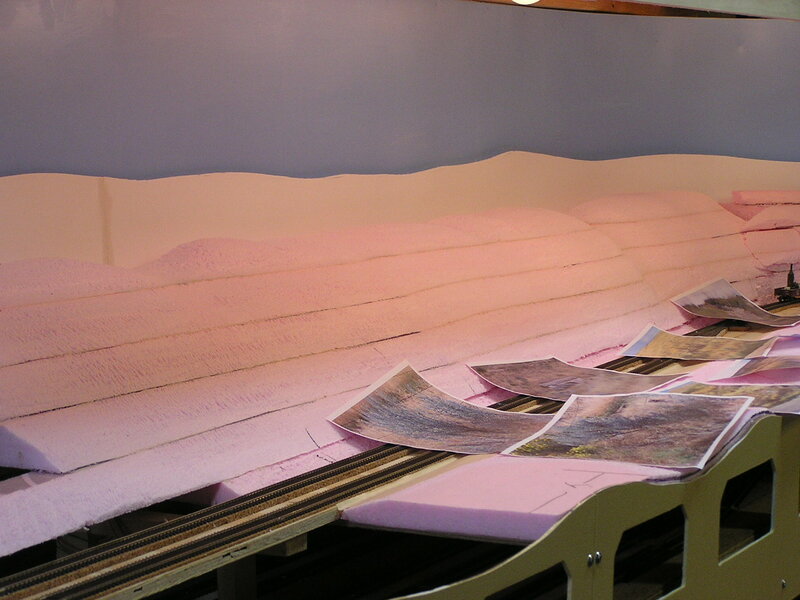 At this point the foam is still in place so I can mark out how much of the hills flat will be visible. 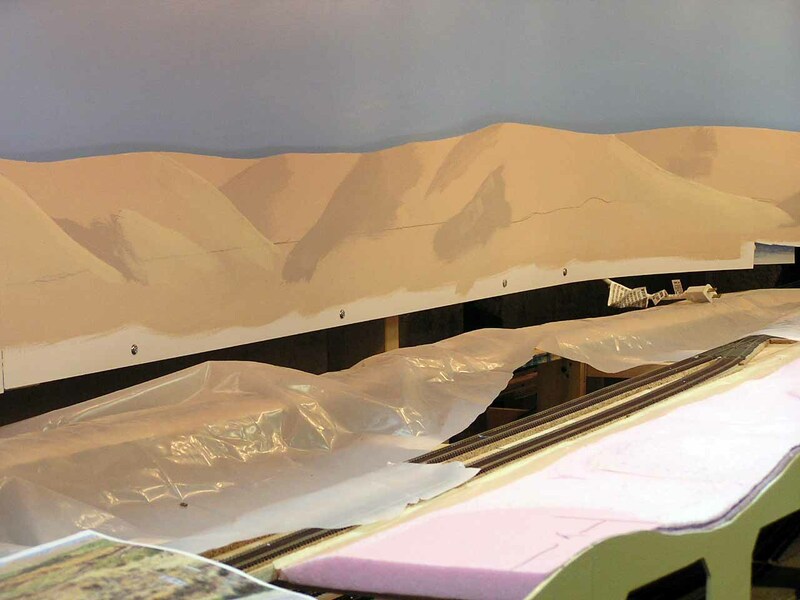 The plan is to paint from the top to an inch or so below the top of the 3-D hills. This is the area after I prepped for paint. 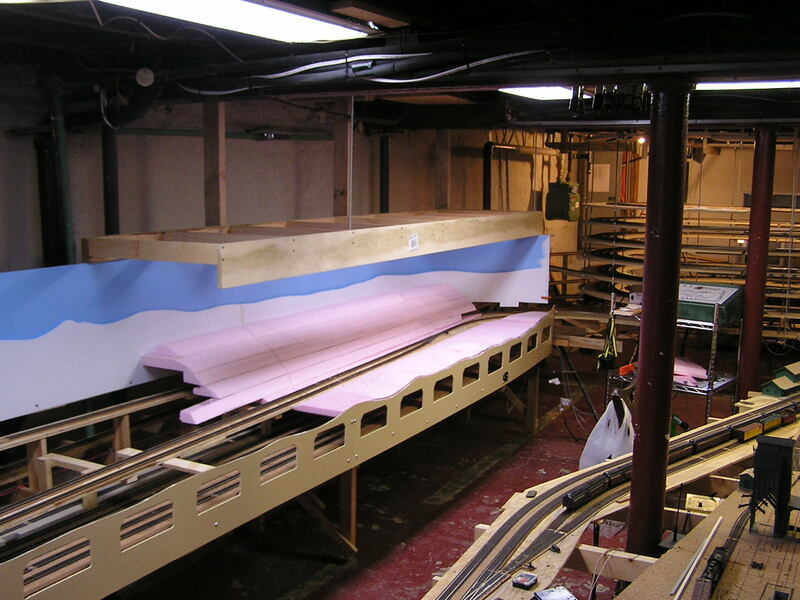 I installed lighting for the lower deck in the upper deck frame, removed all the foam hills and laid down plastic to protect the tracks from any paint splatters. 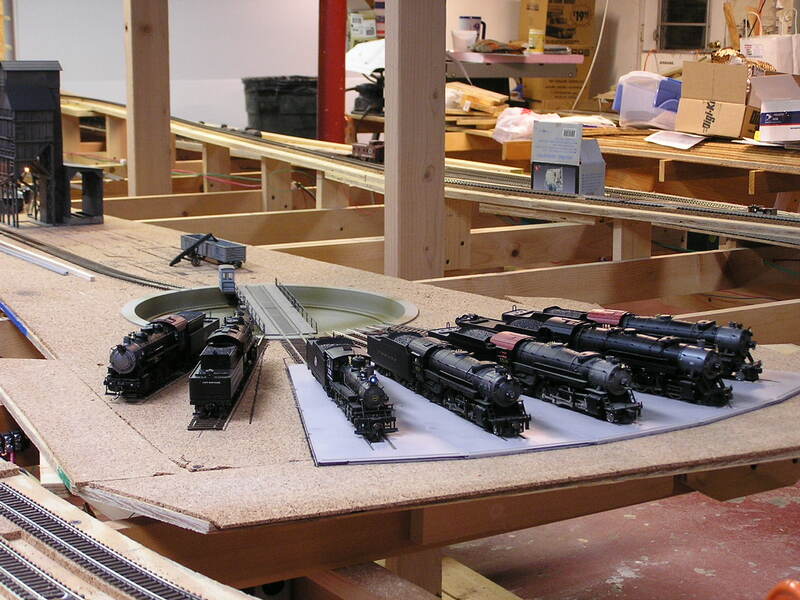 I left the section of foam in front of the track because it makes a convenient work table, as long as I don't put anything too heavy on it. 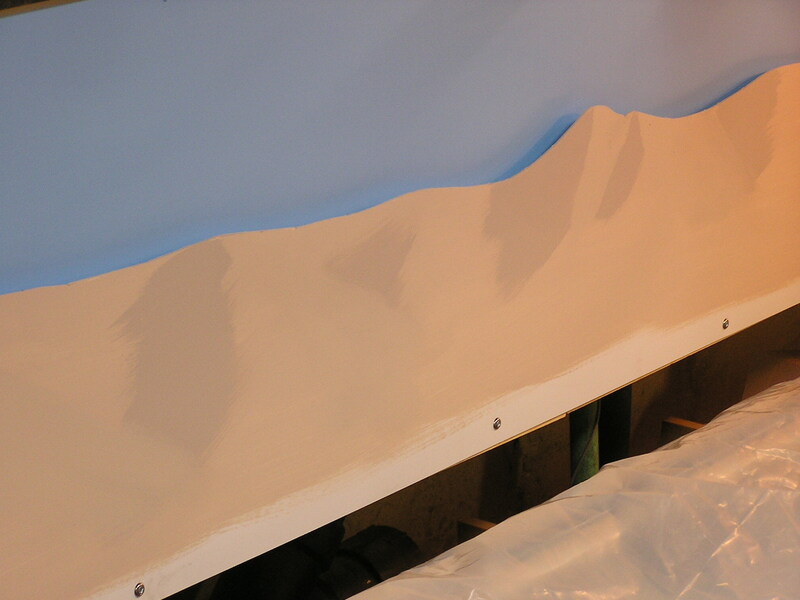 And the first layer of paint is on the hills. The soil is a relatively light color - kind of a deep tan on the surface in this area of the state. 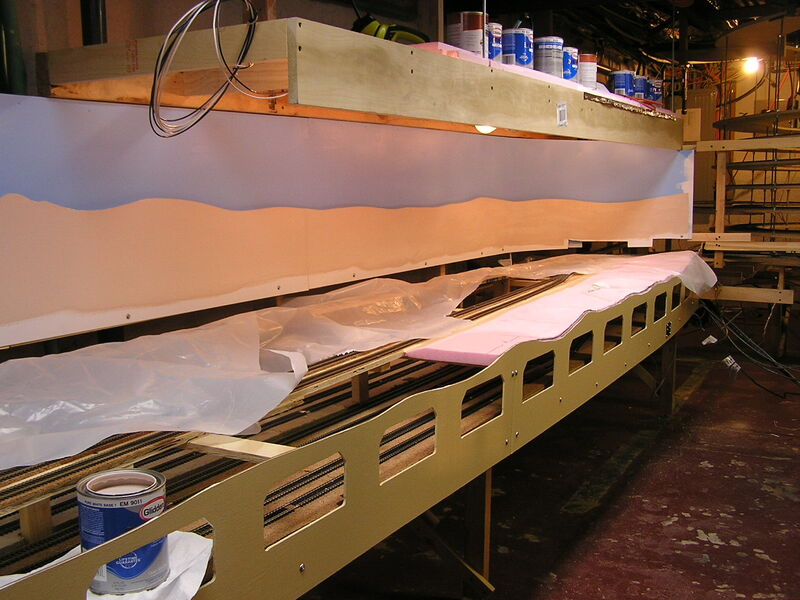 On top of the upper deck frame I lined up all the paint colors I picked out of the photographs. I'll use all of them through this process. A closeup of some of the hills after I added some basic definition to the flat base color. The sun is supposed to be shining on the right sides of the hills, making the left sides a slightly darker color. Now I've added some lighter yellowish grass to the sunlit sides of the hills. 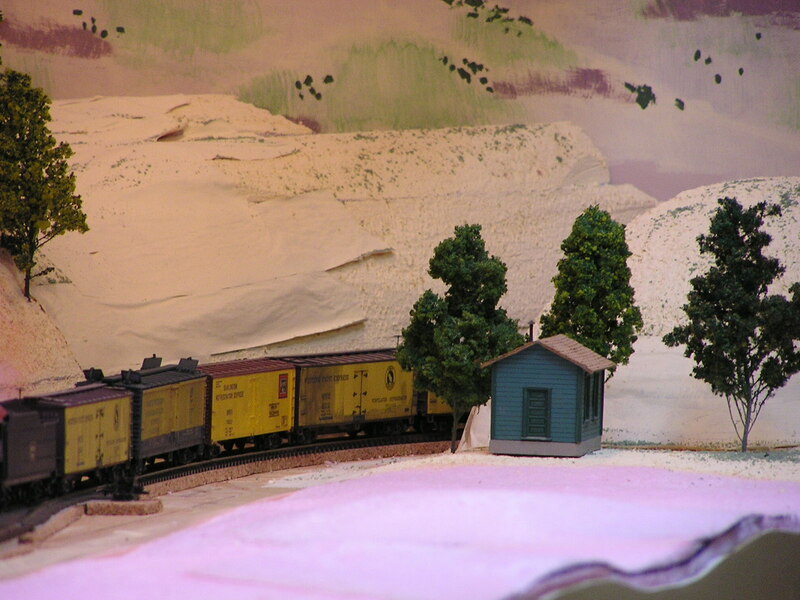 A wider shot of the line of hills after the addition of the yellow grass. And the grass has now been added to the "lee" side of the hills while making sure not to completely over the darker base color. Basic hill painting is done, with the addition of some still-green grass and dark soil bare and semi-bare spots. The whole thing needs to be subdued a bit, but the colors aren't quite as vivid in real life as they look in the photos. While I'm obviously no artist, if we take that into consideration I think the paint job didn't turn out too terrible. It does need improving at some point. 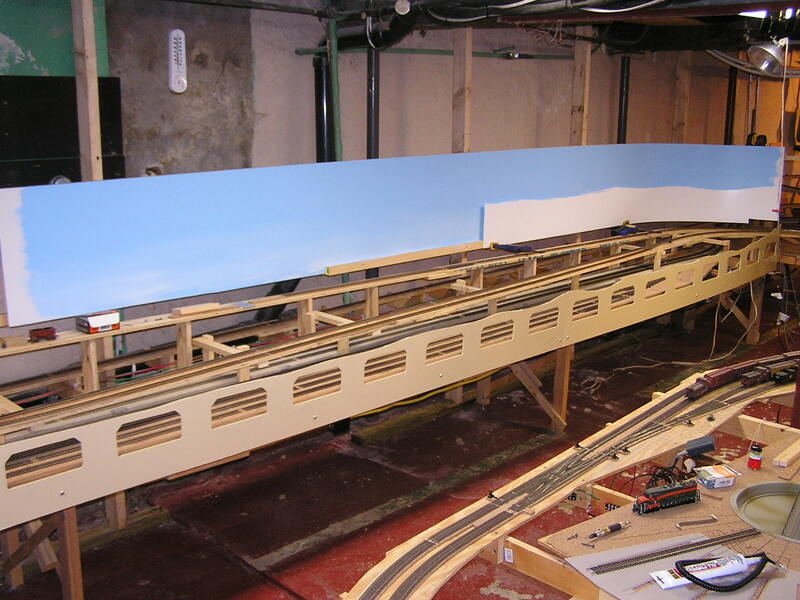 The notched areas at the bottom of the flat towards the right are the cut-outs for trains to pass through the backdrop. 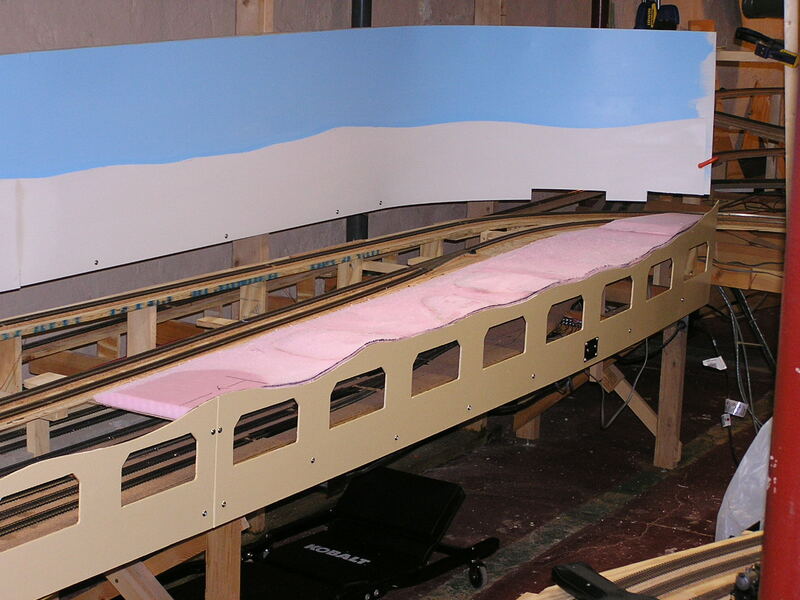 The left notch is for the track that comes out underneath the foam hills, while the right one is where the Glenrock track passes through into the helix. It will be obscured by another hill. 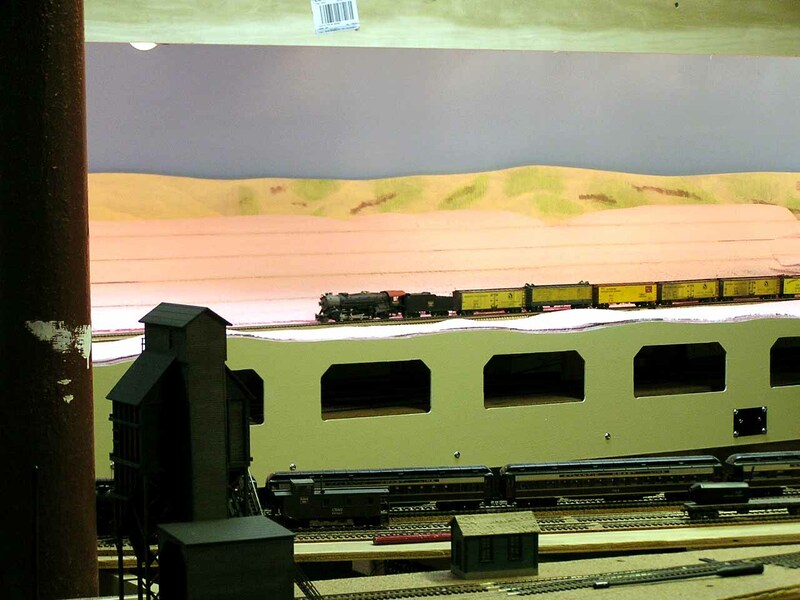 Now the 3-D hills are back in place, showing how the Glenrock trackage curves into view around the notch hiding hill on the far right. Here's a train on the mainline in Glenrock. Laurel is in the foreground. I applied masking tape over the breaks in the foam, stuck a few trees in the ground and added a scratchbuilt tool shed just to get a sense of how things might look someday.